Quickly switches from box-top to flat-top cart to meet the demands of each job. Hinged shelf sides flip up or down independentlyall sides down creates a smooth, flat surface or flip up to create a box-top cart. I-beam supports ease loading and unloading of oversized cartons. 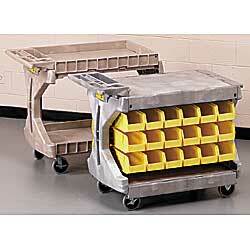 Choose the standard cart or cart with Akro-Bins®on each side. 2 swivel casters with brake and 2 rigid. Cart color: gray. IN STOCK. XL-0904 Gray	 43	 2	 22"	 27-3/4" x 17"	 32"
XL-0906 Gray	 57	 2	 22"	 31-3/4" x 22"	 32"
CARTS WITH (12) 10-7/8" x 11" x 5"H BINS. SPECIFY COLOR: BL - Blue, GN - Green, RD - Red, ST - Stone, YL - Yellow. Bins hang on steel rail kit, included (not shown). B. CARTS WITH (36) 10-7/8" x 5-1/2" x 5"H BINS. SPECIFY COLOR: BL - Blue, GN - Green, RD - Red, ST - Stone, YL - Yellow. Bins hang on steel rail kit, included. C. CARTS WITH (24) 10-3/4" x 8-1/4" x 7"H BINS. BIN COLORS: (8) red, (8) stone, and (8) blue. Bins stack freely 3 high by 4 across. XL-0912 Gray	 93	 2	 22"	 31-3/4" x 22"	 32"
D. CARTS WITH (28) 7-3/8" x 4-1/8" x 3"H RED BINS AND (20) 10-7/8" x 5-1/2" x 5"H BLUE BINS. Bins hang on steel rail kit, included. XL-0914 Gray	 87	 2	 22"	 27-3/4" x 17"	 32"
*With sides flipped up with top shelf.